"Saturated" explores the myriad ways we perceive and use color, from Aristotle's seven-hue spectrum to modern digital prints. 'Color is my day-long obsession, joy and torment," Monet once lamented, while Georgia O'Keeffe noted, "I found I could say things with colors that I couldn't say in any other way—things that I had no words for." Decades later, Steve Jobs sounded a different note, saying, regarding Apple's candy-colored iMacs, "For most consumers, color is more important than megahertz, gigabytes, and other gibberish associated with buying a typical PC." Such is the poetry and the power of color. Color pervades our lives, and yet we probably think little about its many facets, which also include theory, history, utility and mystery. 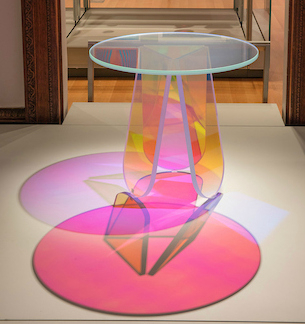 All of those aspects are on view at the Cooper Hewitt, Smithsonian Design Museum, in "Saturated: The Allure and Science of Color," which explores how we perceive and use color. As visitors climb a staircase to the exhibit—which is drawn from printed materials that belong to the Smithsonian Libraries and design objects that belong to the Cooper Hewitt—they should grasp with a glance the first principle, that color is simply light in different wave lengths, via "Peony" (2014), designed by Karel Martens. As light cast by the chandelier above changes shades, so too does the appearance of this wall hanging, with colors shifting in intensity. Digitally printed, "Peony" consists of thousands of multicolored pixels, imprinted with differing designs and arranged by an algorithm to form the flower. "Saturated" then takes visitors through "seven phases of color"—a reference to the seven hues Aristotle cited in his color spectrum in the fourth century B.C.—in sections like "Creating Color" and "Color and Form." Aristotle, who linked his theory of color harmony to musical harmony, isn't the only notable making an appearance in the show. Nearly two millennia later, Isaac Newton took inspiration from Aristotle when he devised a seven-hue spectrum, citing red, orange, yellow, green, blue, indigo and violet as the colors that are gleaned from the refraction of white light. That is represented here by his groundbreaking 1704 book, "Opticks, or, A Treatise of the Reflections, Refractions, Inflexions and Colours of Light." Goethe would later challenge Newton, writing his own book, "Theory of Colors" (1810), after studying the physiological effects of color. Before and after, chemists, entomologists, physicists, ornithologists, paint manufacturers and designers tried, in the museum's parlance, to "Capture Color"—including Moses Harris (1731-1785), who created an early color wheel to help naturalists identify insects, and game-maker Milton Bradley, who pioneered his own color wheel. Attempts to organize, describe and measure color continue today, especially as standardization has grown in importance in global commerce. Color's mysterious properties, like iridescence, fluorescence and optical illusions, are still being explored and exploited. As Josef Albers wrote in his seminal book, "Interaction of Color" (1963)—a copy of which is on view—"In order to use color effectively it is necessary to recognize that color deceives continually." The exhibition offers such examples as a Tiffany Peacock Vase (c. 1901) and a 19th-century Indian fabric woven with beetle wing casings for iridescence, as well as 21st-century Nike running shoes in fluorescent green. Elsewhere, posters, textiles, decorative arts and furniture illustrate the themes. Try to imagine a legible New York City subway map without color. Going back further, the 1874 book "Statistical Analysis of the United States Based on the Results of the Ninth Census 1870" could never have communicated its extensive data successfully without employing color in infographics. 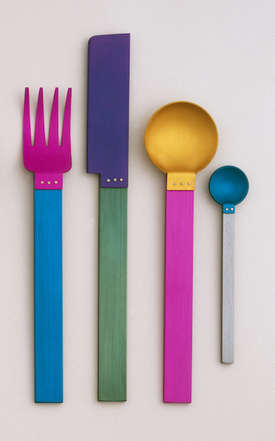 Designers use color even when they don't have to—consider how Oxo color-coded its measuring spoons to make them more user-friendly and how AT&T deployed pastels, like pink, to popularize its Princess phones. Among the newest developments is the clear glass "Shimmer Table" (2014), designed by Patricia Urquiola and made by Glas Italia. It seems, at various times, to be purple, yellow, blue—all the colors in the spectrum—and it casts colorful shadows, too, depending on the angle of the light source and the vantage point of the viewer. No pigment is involved; its special glossy finish, enabled by nanotechnology, refracts light, like a prism. "Saturated" is an enlightening exhibition. Curators Jennifer Cohlman Bracchi and Susan Brown try hard to make it engaging, too. There's an out-of-register floral wallpaper (2015) which, when viewed through red and blue anaglyph glasses, appears three-dimensional. 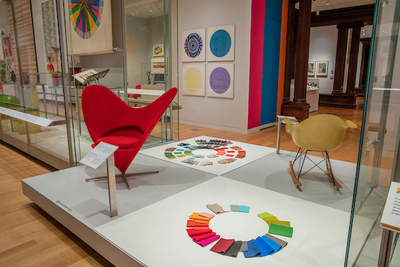 There's a fiberglass Eames rocking chair (c. 1948-50) and a Panton heart cone chair (1959) by Danish designer Verner Panton (1926-1998), alongside the color wheels developed for their manufacture. There's a 1968 Joffrey Ballet poster in bright yellow and blue that seems to suggest movement. 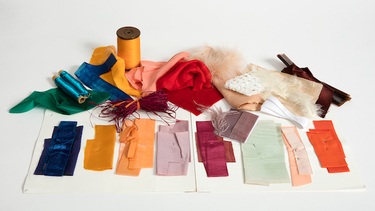 There's a station for PeclersParis, the famed trend forecasting company, with bottles of dye, swatches of fabric and a copy of its biennial "Color Trends Book" for manufacturers and designers that visitors may peruse, touching its color patches and tassels. But this short history of color in 190 objects is hampered by the widespread museum practice of limiting the length of labels, here to about 50 words. Hard-to-convey subjects like this—relating color and music, for example—require more, and there's no catalog to consult, either. What a pity.